A detailed and responsive instrument that combines distinctive tonality with flexibility. Sounds absolutely stunning. A joy to use. The Klavins Una Corda, originally created for Nils Frahm, is an exquisite piano which uses one string per key ('una corda' is Italian for 'one string') instead of the usual two or three, and has no enclosure, revealing its asymmetrical stainless steel frame (check out the Native Instruments and Klavins Pianos websites for pics and videos). 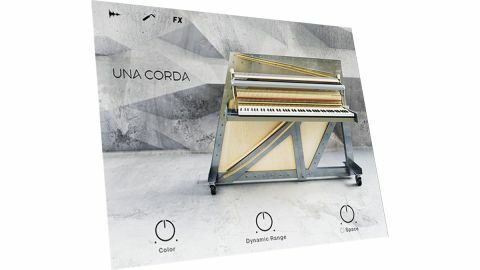 The Native Instruments Una Corda comes as a 10.7GB library instrument for Kontakt 5 (full and Player) and features three main patches, differentiated by damping material, and therefore transient/ harmonic characteristics: Pure, Felt and Cotton. The main interface page has three overall controls: Color, Dynamics and Space. The first two adjust the sample mapping/triggering to affect soft/hardness and dynamic range, while the third is a mix level for the convolution reverb (Space). Three parameter-packed pages (Workbench, Response and Finish) can then be accessed to fine-tune the Una Corda. The real Una Corda sounds amazing, but then we've only heard it played by Nils Frahm! Fortunately the NI Una Corda sounds (a) just like the real thing and (b) stunning, even with no prior knowledge. It is a highly responsive instrument, detailed and sonically luscious. It's worth noting that this is not a normal piano sound, possessing a truly distinctive timbre, but with the controls available this can be radically tailored to many situations. It is a joy to play, particularly as it acts less like a solitary instrument and more as a sound source for tone and texture. The Workbench page splits into Tone and Noises to set the essential Una Corda sound, from harmonic balance and resonance to room ambience and player noise (pedal rumble, breathing, fidgeting, etc). The distinct percussive aspect of the Una Corda is tailored with six damping fabrics, Mechanical noise contouring and accompanying level controls. The Response page adjusts just that, with controls for attack and release behaviours, sustain pedal action, velocity curve, keymap balancing and tuning. As with the Workbench page, fine-tuning is easy, as is radical restructuring. The Finish page is the icing on this piano-shaped cake. A simple three-band EQ tempers and accentuates work done on the previous pages. A transient control and compression/tape section shapes the dynamics without numerous parameters - just two sliders and a drop-down menu of 17 comp/tape styles. Next to these are Stereo Image and Style, the latter of which is a more complex affair offering dramatic timbre shifts and distortions, modulated filter effects and delay-type treatments. Finally, there is the Space section featuring reverbs (rooms, springs, plates, etc), echoes and delay effects with just two slider controls for Size and Distance. What seems like a simple, though highly detailed, sampled instrument turns out to be a considerably more complex and flexible package that is both musical instrument and sound design tool. The Una Corda is immersive, responsive and highly creative, capturing the character of the original instrument, and pretty much justifying the price before the sound design aspect is even considered.